You'll find plenty of places to visit near Cancun: Isla Mujeres (Playa Norte & Punta Sur). Spend the 15th (Mon) among aquatic life with a scuba or snorkeling tour. There's lots more to do: buy something for everyone on your list at La Isla Shopping Village, find something for the whole family at Selvatica, stop by Plaza Las Americas, and stroll through Playa Delfines. For ratings, traveler tips, maps, and other tourist information, you can read our Cancun trip planning site . Rio de Janeiro, Brazil to Cancun is an approximately 15-hour flight. Traveling from Rio de Janeiro to Cancun, you'll gain 2 hours due to the time zone difference. In April in Cancun, expect temperatures between 34°C during the day and 27°C at night. Finish up your sightseeing early on the 15th (Mon) so you can travel to Cozumel. Cozumel is known for wildlife, outdoors, adventure, beaches, and theme parks. Your plan includes some of its best attractions: look for all kinds of wild species at Wildlife Areas, get in on the family fun at Discover Mexico Park Cozumel, put a fun spin on your tour with The Amazing Cozumel Race, and explore the gorgeous colors at Chankanaab Reef. To see maps, where to stay, reviews, and more tourist information, go to the Cozumel online travel route planner . Traveling by flight from Cancun to Cozumel takes 2.5 hours. Alternatively, you can do a combination of bus and ferry. Expect a daytime high around 33°C in April, and nighttime lows around 24°C. Cap off your sightseeing on the 21st (Sun) early enough to travel to Tulum. Get out of town with these interesting Tulum side-trips: Sian Ka'an Biosphere Reserve (in Sian Ka'an), Cobá Zona Arqueológica Cobá (in Coba) and Xcaret Park (in Playa del Carmen). Plan for a day of cool, family-friendly fun on the 22nd (Mon) at Xel-Ha. Next up on the itinerary: explore the ancient world of Tulum Archaeological Site, explore the activities along Gran Cenote, head outdoors with Ana y Jose Beach Club, and relax and rejuvenate at some of the best spas. Plan a Tulum trip in moments using our itinerary builder. You can do a combination of ferry and bus from Cozumel to Tulum in 2.5 hours. 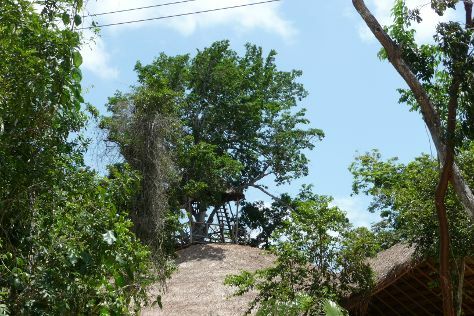 In April, daytime highs in Tulum are 33°C, while nighttime lows are 24°C. Finish your sightseeing early on the 28th (Sun) so you can drive to Chichen Itza. Explore Chichen Itza's surroundings by going to Ek Balam (in Ek Balam Village), Valladolid (Cenote Palomitas, Zazil Tunich, & more) and Iglesia de Eknakan (in Cuzama). For other places to visit, photos, ratings, and tourist information, refer to the Chichen Itza road trip planner. Drive from Tulum to Chichen Itza in 2 hours. Alternatively, you can take a shuttle; or take a bus. Prepare for a bit warmer weather when traveling from Tulum in April: high temperatures in Chichen Itza hover around 39°C and lows are around 30°C. Wrap up your sightseeing on the 2nd (Thu) early enough to travel to Palenque. Palenque remains best known for the nearby ruins of an ancient Mayan city, which probably flourished around the 7th century CE. Change things up with a short trip to Tonina in Ocosingo (about 1h 55 min away). There's still lots to do: explore the ancient world of Zona Arqueologica de Palenque, take in the dramatic scenery at Cascadas de Misol-Ha, examine the collection at Museo de Sitio de Palenque "Alberto Ruz Lhuillier", and don't miss a visit to Iglesia Santo Domingo. To find photos, traveler tips, where to stay, and tourist information, you can read our Palenque trip itinerary tool . You can do a combination of bus and flight from Chichen Itza to Palenque in 7.5 hours. Other options are to drive; or take a bus. You'll gain 1 hour traveling from Chichen Itza to Palenque due to the time zone difference. Finish up your sightseeing early on the 6th (Mon) so you can travel to Puebla. Change things up with these side-trips from Puebla: Iglesia de Santa Maria Tonanzintla (in San Andres Cholula), Murals of the Government Palace (in Tlaxcala) and San Pedro Cholula (Parroquia de San Andres Cholula & Zona Arqueológica de Cholula). And it doesn't end there: take in the architecture and atmosphere at Catedral Basilica de Puebla, don't miss a visit to Zocalo, see the interesting displays at Amparo Museum (Museo Amparo), and admire the masterpieces at Museo Jose Luis Bello y Gonzales. For other places to visit, more things to do, photos, and more tourist information, go to the Puebla vacation maker . You can do a combination of flight and bus from Palenque to Puebla in 5 hours. Other options are to do a combination of bus and flight; or drive. In May, plan for daily highs up to 32°C, and evening lows to 13°C. Finish your sightseeing early on the 11th (Sat) to allow enough time to travel to Mazatlan. Mazatlan is known for historic sites, adventure, nature, beaches, and zoos & aquariums. Your plan includes some of its best attractions: admire the landmark architecture of Immaculate Conception Cathedral, get outside with Venados Baseball Club, tour the pleasant surroundings at Playa Las Gaviotas, and get interesting insight from Tours. To find maps, traveler tips, other places to visit, and tourist information, refer to the Mazatlan trip itinerary planner . Traveling by combination of bus and flight from Puebla to Mazatlan takes 4.5 hours. Alternatively, you can take a bus; or drive. You'll gain 1 hour traveling from Puebla to Mazatlan due to the time zone difference. 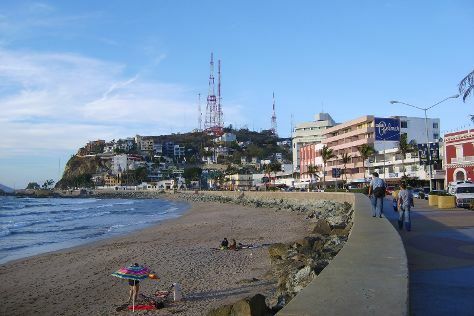 Traveling from Puebla in May, expect a bit warmer with lows of 22°C in Mazatlan. 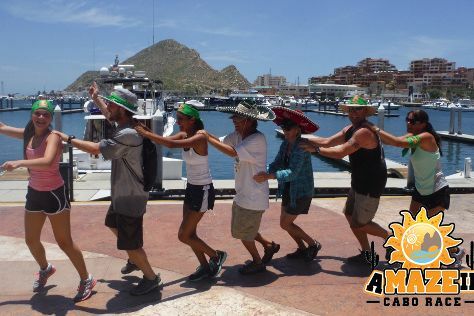 Wrap up your sightseeing on the 16th (Thu) early enough to travel to Cabo San Lucas. Cabo San Lucas is known for wildlife, nature, nightlife, beaches, and adventure. Your plan includes some of its best attractions: take in the dramatic natural features at El Arco de Cabo San Lucas, enjoy the sand and surf at Playa del Amor, partake in some friendly competition at A-maze-in Cabo Race, and get close to the beloved marine mammals with a swim-with-the-dolphins experience. For traveler tips, where to stay, and tourist information, use the Cabo San Lucas journey maker app . Traveling by combination of bus and flight from Mazatlan to Cabo San Lucas takes 6 hours. Alternatively, you can fly; or drive. In May, plan for daily highs up to 34°C, and evening lows to 25°C. Wrap up your sightseeing on the 22nd (Wed) to allow time to travel to Puerto Vallarta. Venture out of the city with trips to Vallarta Botanical Gardens (in Cabo Corrientes), Bucerias (Art in Amber, A Broken Art, & more) and Dolphin & Whale Watching (in Sayulita). There's much more to do: take a leisurely stroll along Malecon Boardwalk, head off the coast to Marietas Islands, appreciate the extensive heritage of Zona Romantica, and make a trip to Parish of Our Lady of Guadalupe. To see reviews, where to stay, photos, and more tourist information, go to the Puerto Vallarta trip itinerary app . Fly from Cabo San Lucas to Puerto Vallarta in 6 hours. Alternatively, you can do a combination of bus and flight; or drive. You'll lose 1 hour traveling from Cabo San Lucas to Puerto Vallarta due to the time zone difference. In May, plan for daily highs up to 34°C, and evening lows to 26°C. Cap off your sightseeing on the 28th (Tue) early enough to travel to San Miguel de Allende. Explore San Miguel de Allende's surroundings by going to Guanajuato (Alhondiga de Granaditas & Don Quixote Iconographic Museum (Museo Iconografico del Quijote)). And it doesn't end there: admire the landmark architecture of Parroquia de San Miguel Arcangel, walk around El Charco del Ingenio, don't miss a visit to Convento de Santa Clara, and get lost in a book at Biblioteca Pública de San Miguel de Allende. To find other places to visit, ratings, reviews, and more tourist information, you can read our San Miguel de Allende holiday planner . Getting from Puerto Vallarta to San Miguel de Allende by combination of flight, taxi, and bus takes about 4.5 hours. Other options: do a combination of flight and bus; or drive. Plan for slightly colder nights when traveling from Puerto Vallarta in May since evenings lows in San Miguel de Allende dip to 15°C. Wrap up your sightseeing on the 2nd (Sun) to allow time to drive to Mexico City. Mexico City is known for museums, historic sites, nightlife, shopping, and parks. Your plan includes some of its best attractions: examine the collection at Museo Nacional de Antropologia, walk around Bosque de Chapultepec, admire the landmark architecture of National Palace (Palacio Nacional), and delve into the distant past at Museo del Templo Mayor. To find more things to do, photos, other places to visit, and more tourist information, go to the Mexico City trip planning app . You can drive from San Miguel de Allende to Mexico City in 3.5 hours. Alternatively, you can take a shuttle; or take a bus. Traveling from San Miguel de Allende in June, you will find days in Mexico City are a bit cooler (28°C), and nights are about the same (16°C). Wrap up your sightseeing on the 7th (Fri) to allow time to travel back home.